We at bmbg consult strongly believe that the development of companies and organisations should be fully aligned with the expectations and needs of ALL stakeholders. Hence, the clear economic requirements and aspirations of an organisation shall be properly balanced with the expectations of customers, employees, suppliers, partners, and the society. Studies have shown that companies and organisation that master that balance are especially successful in their area of activity. That does not only hold true for large companies, but also for small and medium size enterprises, and for public or not-for-profit organisations. Based on the principles of the EFQM Excellence Model we have developed a dedicated consulting and coaching concept that helps you to take the right steps towards an increasing level of excellence and implement it most of it yourself. We familiarize you with the tools and methods of the EFQM Model, that gives you a framework for a tailored strategy for your organisation’s ambitions on the path towards excellence. 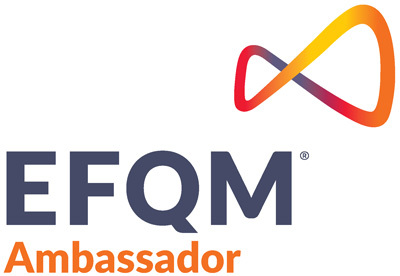 We provide a broad background of technical and methodical experiences of working in manufacturing organisations combined with 6 years as an EFQM Assessor for the EFQM Global Excellence Award. You can browse through the list of the finalists of the EFQM Global Excellence Award of the previous years on the pages of EFQM. Start your Journey to Excellence now! Do you want to take your organization onto this journey and learn all about the method behind the EFQM Model, profit from the best examples of a large community of excellent organizations, and establish a management system that allows for a balanced growth and sustainable excellent results? Depending on your location, needs, and interests we can support you directly with our own consultancy or training or help you to find the right place and partner from either the German EFQM Partner organizations DQG (Deutsche Gesellschaft für Qualität) and ILEP (Initiative Ludwig Erhard Preis) or any of the other EFQM Ambassadors. Which organization could profit from the introduction of EFQM?